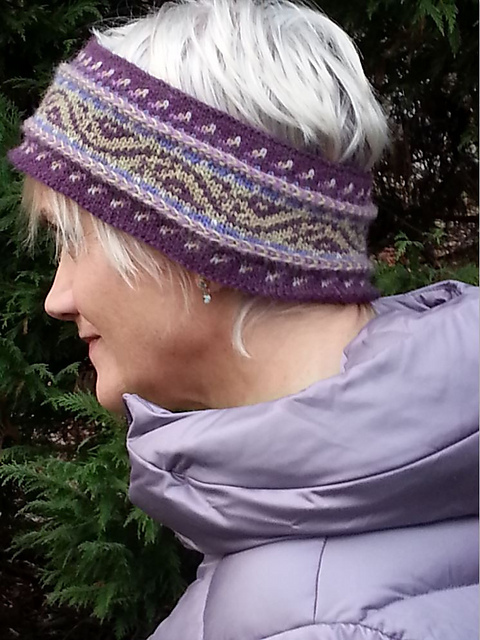 The headband she knit (it’s a free pattern here on the blog) has a short, uniform repeat with no long floats and no shaping, so it’s an ideal stranded knitting starting point. I think her next level in building some mad stranded knitting skills should focus on two things: simple shaping and irregular motifs. I’ve just designed two new “next level” projects that will hopefully lead new stranded knitting nuts a bit further up the ladder. 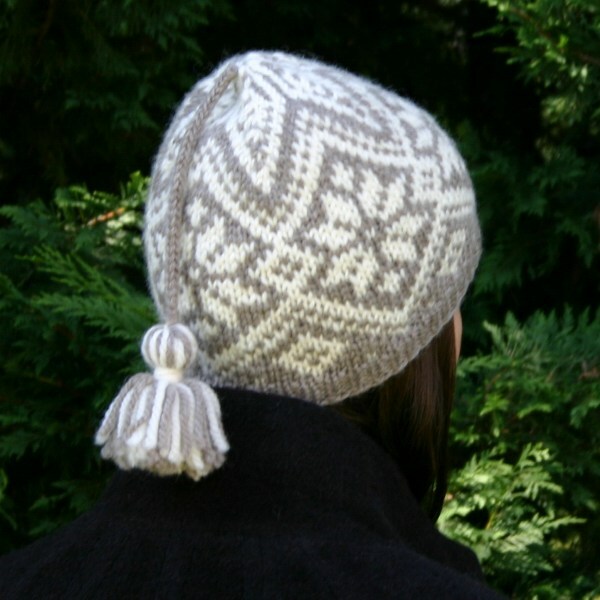 The Macadamia Hat has very simple shaping atop and a decidedly less-uniform motif below. So, the chart work definitely requires a bit more attention, but it’s easy to focus on each new aspect entirely, since the shaping and color work areas are separate. There are a few things I especially love about this hat: The motif is a little unusual – a bit quirky, rather nutty (yes, like me!) The gauge is a bit heavier than what I usually use for my stranded work, but the Hegre takes to colorwork nicely and rewards me with an FO in no time! Last, but not least, I am madly in love with this wonderful, huggable, new Hegre. It’s so soft, I was certain it must have a fair dose of cashmere or alpaca in it; imagine my delight as I read the ballband: “100% pure new wool”! If I have my way, you’ll be seeing a lot more in Hegre from me soon! Macadamia Hats knit in Hegre. 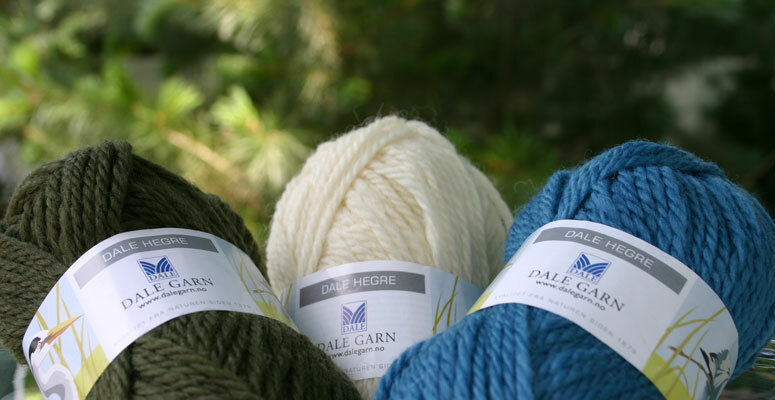 Cerulean + Light Sheep Heather on left; Deep Olive + Light Sheep Heather on right. You just need 1 ball of each of the 2 colors per hat. One of the things I love about more irregular, organic motifs like this is that the pesky, end-of-the-round jog that drives me nuts with geometric motifs nearly disappears here. The hat as worn was photographed with the end of the round showing, but far less than usual, dead center. 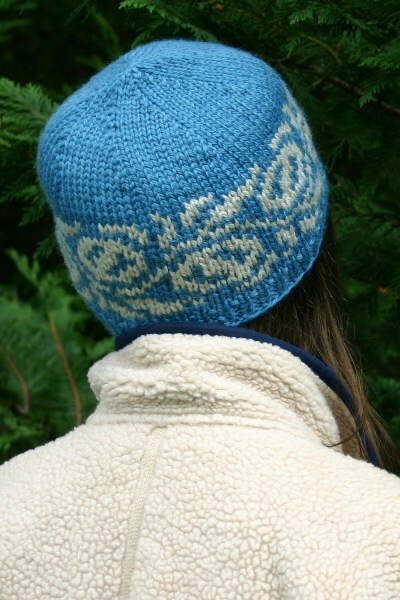 The North Star Hat combines some simple shaping with simultaneous chart work, yet the motifs are traditional, old favorites that are easy to track. As soon as I completed the one you see here, my rowdy boys were clamoring for North Star Hats of their own, so I guess we can call them “unisex”, too. 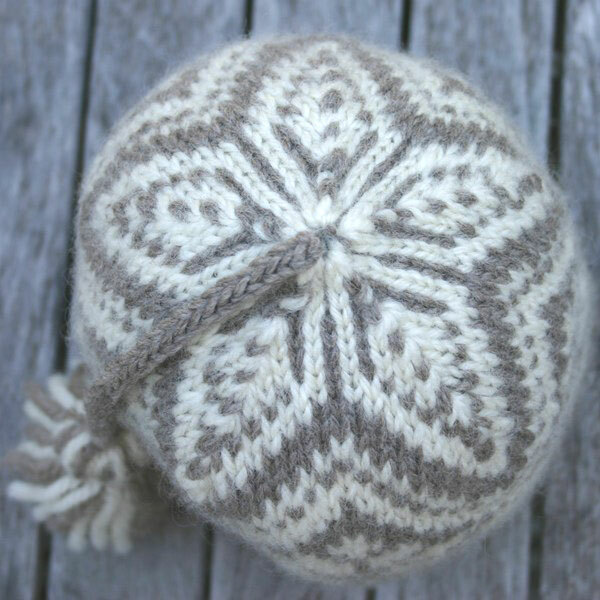 North Star Hats in Hegre, using 1 50g ball of medium sheep heather #3841 and 1 50g ball of light sheep heather #2931. 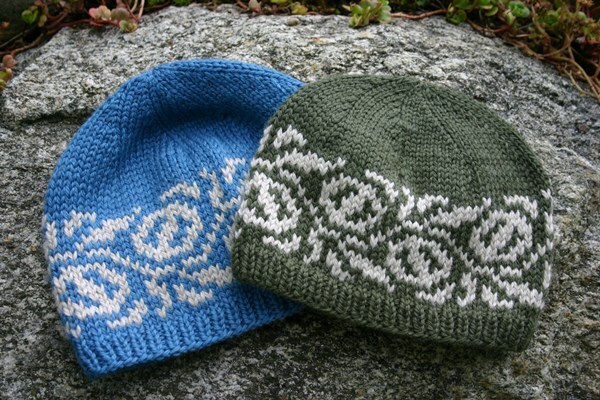 I knit the boys’ must-be-machine-washable hats in Dale of Norway Freestyle yarn – again, just 2 50g balls total; 1 each of 2 contrasting colors. There are three sizes within each design – youth, average adult and extra large adult – the different sizes are achieved simply through different gauges. Let me know if you have any further questions. Happy knitting! 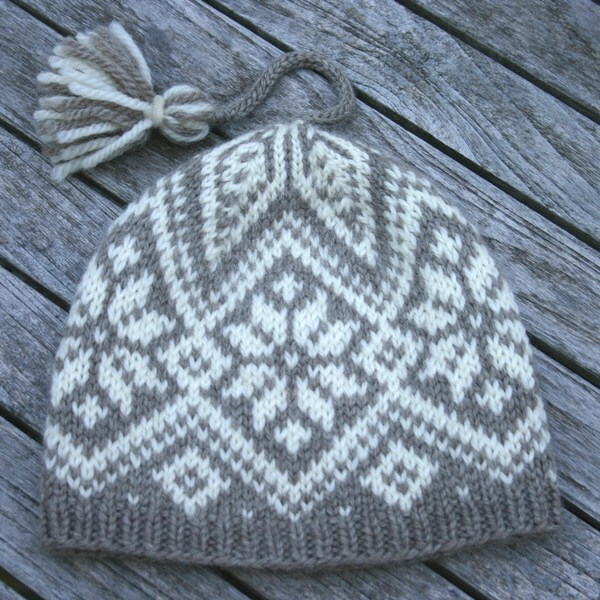 This entry was posted in Knitting, Mary Ann's Designs, New From Dale of Norway, Norwegian Knitting, Uncategorized and tagged Dale of Norway, fair isle, hat, hegre, knit, Knitting, norwegian, ski hats, yarn. Bookmark the permalink. I’m wondering how you make the pattern line up at the “join” I’m new to stranded knitting and your hat looks flawless. Thanks in advance for any tips! Long answer: Circular knitting is not really circular at all – it’s spiral. As with any spiral, the rounds in knitting don’t meet up with each other, end to end; rather, the end of a round is always one stitch/row/round higher than the beginning of the round. There are some tricks you can pull to bring that low start of the round up toward to level of the end of the round. The most common trick is to simply slip that first, clashing, low-hanging stitch when you come upon it on the next round. Some will lift the low stitch up and knit it with the new stitch. Either approach can occasionally help in colorwork. More often, moving stitches around in colorwork causes other problems. Slipped and lifted stitches distort the fabric. Slipped stitches are longer vertically – that can show up as a mistake in colorwork. While it might help to vertically align that old starting stitch, you could also be doing more harm than good to its horizontal orientation with its neighboring stitch. In short, there’s no good way to move around strategically placed stitches without negatively impacting another aspect of the piece. There are really three better ways to manage this issue in colorwork: Number One, position the end of the round at a spot that does not visually disrupt the motif (as I’ve done with the Macadamia Hat.) Number Two, use vertical lines at the beginning/end of the round to trick the eye and lessen the visual impact of the shift (as I’ve done with some of my other work: Look at some of the photos on my PDF page here on the blog: https://twostrands.com/knitting-pattern-pdfs/ You’ll notice plenty of vertical lines on pieces such as mittens and gloves at spots where the beginnings/ends of rounds are particularly pronounced.) Number Three, blithely ignore it. Honestly, Number Three is far and away the most common approach in the world of colorwork. Compare any machine made hat to a hand made, circularly knit hat and I’m sure you’ll see that the 1-stitch shift at the otherwise-smooth end of the round is NOTHING compared to the probably-mismatched, machine-sewn, bulky-seamed join at the back of any commercial hat.